Oscar On Mel Gibson Movies, Harry Reid's Wife-Beating, Etc. Oscar On Mel Gibson Movies, Harry Reid’s Wife-Beating, Etc. As we did before introducing his previous entry, we at TheHayride.com would like to caution the reader that Oscar’s views and statements expressed in this column don’t represent our editorial position other than solely by coincidence. He’s on his own. 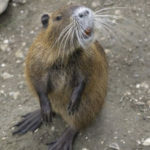 And he’s a nutria – so please don’t judge either us or him too harshly. It’s important to understand that he’s only here because we’re trying to diversify our staff of contributors. I want to start off with an apology, first of all. It’s been two weeks since I wrote. A lot has gone on down here in Barataria where you’ll find me and mine lately. With all this cold weather coming through, we’re pretty uncomfortable. No, stupid, we’re not cold. But you are. And in case you don’t know it, there are people who like us more for our fur than our political opinions. We’ve been dodging traps since the friggin’ Picayune wrote that damn article about the society chicks doing fashion shows in which they’re modeling hoodies and stoles cut off some poor little guy’s rump. It was one thing when they sent the sheriff’s deputies at us; those guys couldn’t hit the broad side of a barn, particularly at night. But this is somethin’ else altogether. So I’m all about PETA these days. Fur is murder, y’knowhatimean? Speaking of murder, that cat Obama sure is killin’ his presidency, huh? They ain’t much for reading polls in that White House. I thought that guy Axelrod – whose head looks kinda like my cousin Emile after his chemo, by the way – was supposed to be some kinda genius. He must be more use with a rent-a-mob than a spin cycle; otherwise I don’t think these guys would be comin’ out with something like that Mel Gibson movie with the Australians and the Turks I saw a few nights ago. What was the name of that thing? Oh, yeah. Gallipoli. Don’t look at me like that. We have DirecTV down here. I see all kindsa stuff. Anyway, this Gallipoli flick was about a bunch of Australian blokes – Gibson was one of them; he used to be Australian before Danny Glover turned him into a nut. And they all joined the army in World War I, so the Brits decided to use them against the Turks. The whole thing starts out fine; they got to hang out in Egypt before they had to go into battle and saw the pyramids, harrassed the locals, rode around on donkeys and camels and generally had a good ol’ time. Kinda like Obama and his guys during the election and the beginning part of his presidency before he slammed the cops in Cambridge for arresting his buddy and in the process tubed his popularity. But all good things come to an end, and in the movie it came time for them to deploy. The Brits decided – interestingly enough it was that dude Churchill whose bust in the Oval Office Obama gave the bum-rush to who dreamed up this caper – that they needed to take this peninsula in Turkey that would give them the ability to (1) knock the Turks out of World War I and (2) open up a path to the Black Sea that they could use to resupply the Russians, who were getting their butts kicked by the Germans. So in went the Australians, among others, to try to land there and take the place over. But it didn’t go so hot. Basically what happened is they got to shore, the Turks shelled the crud out of them, they had to dig in on the beaches and every time they came up out of their trenches they got cut to ribbons. Pressing the attack was suicide. It was nuts, but the Brits wanted Gallipoli no matter what the cost might be. Yeah, it’s pretty sad. Stupid and pathetic, too. But so is this healthcare thing. Do you think Obama or Axelrod or that ballerina guy who goes around calling people F’ing retards will pass one of those little whistles to Harry Reid or Nancy Pelosi in advance of the vote on this next trip over the top? Speaking of Reid, what’s his deal? I hear he’s going around saying they’ve gotta pass a jobs bill because guys who don’t have jobs beat up their wives? Really? Does he know that from personal experience? When he gets tossed out on his pooper in November, is he planning on batting the Missus around some? Guess she’s got it coming; I dunno. A good rule we rodents have is that you speak fer yerself. Harry may look a little like a rat, but he doesn’t have the sense of one – that much I can tell you. Not that I’m a rat. Don’t call me a rat, by the way. We covered this before. You can call Tony Kornheiser a rat if you want, though. I don’t think he’s going to mind. Did you hear about this? Kornheiser tore into Hannah Storm on ESPN the other day for her choice of apparel, saying she looked like she had a sausage casing on for a blouse or something. They suspended him for it and he apologized. He said he’s a troll and he’s got no call to jump anybody for what they look like. I gotta be honest – I dunno what the big deal is. Sausage casing is GOOD. Yeah, we mostly eat plants – which I don’t really get why you people hate us for, since you go around talking about how you ought to be vegetarians and then when we do it you wanna shoot us – but if you throw me a sausage here and there, I’m all about it. I guess Hannah must be one of those salad-eaters or something and that’s why she got all bent out of shape. But what do I know? I’m no fashion expert. I don’t gotta be; I look like nine bucks or so perfectly naked. That’s a lot more than you can say for Kornheiser.